I am the oldest of the Moore girls. I have been sewing and doing many projects for years. I was so happy to hear my sister Cheryl came up with this idea on putting are projects online to share with everyone. I joy is that I make these projects for other people to enjoy, I just love making them. Brought up in a home where all your mother did was sew, kind of passed on to all four girls. 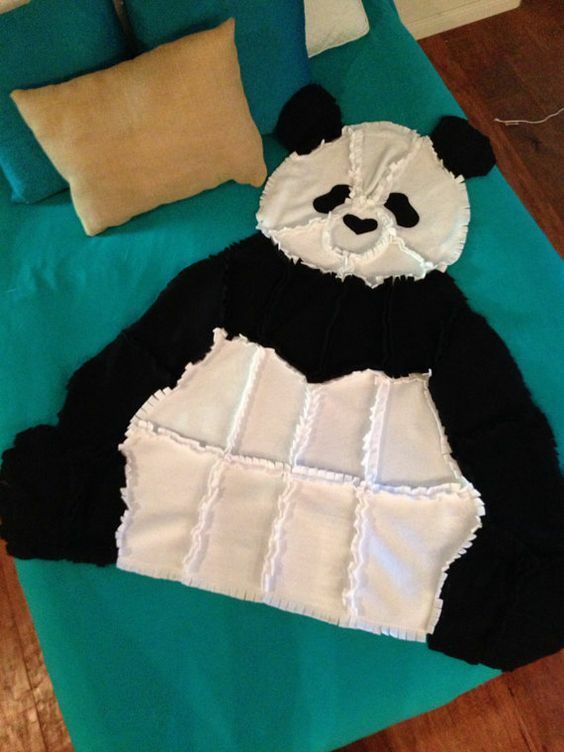 Today I am sharing a Panda Bear Blanket I made for my grandson. This delightful panda bear fleece throw is approximately 52” by 60” in size. It is made with black and snow white fleece. It is a great gift to be used while relaxing on the couch, in bed, or even a wall hanging! It is super soft and comfy! You can wash it in cold water and dry it on low heat! Everyone will love this charming panda bear throw! The grand-kids love this quilt. They love dragging it around and cuddling with it. Its FUN! It is perfect for a twin size bed and it dresses up a double bed. You will love it! Great throw while watching TV, or reading a book. Would make a great lap blanket for anyone. This blanket would be terrific for the beach too! Great conversation piece. Remember, washing it helps with the ragging effect. My quilts are made with fleece. Light weight only about 2.8 lbs but snugly warm. For baby on up to any age. It’s a blanket that anyone would want to cuddle. If the Panda is not for you, Consider a puppy, bear, butterfly, fish, lady bug, polar bear, caterpillar, turtle, dinosaur, owl, or flower. This would make a very unique gift. Machine wash, tumble dry low. This quilt has been pre-washed to start the ragging process. the more you wash the more comfy it will get. Makes a great keepsake.